I couldn’t stand the itch of not traveling during the recent one week school holiday. By hook or by crook I had to bring the family somewhere. I have a list of “Where to Go” and Banting and Jugra are on the list. So that’s how our Banting road trip started. I began planning the trip a week before and had a few items lined up. We wanted to get more people to go but everybody was busy with their own plans. As a result, only four of us embarked on the day trip. 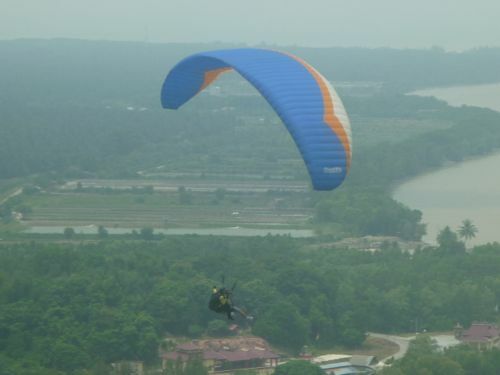 Tell you a secret: What attracted me to go to Banting (Bukit Jugra especially) is paragliding. For some reason, I am very fond of this adventure sport. I did some research on this and until the last minute, I had not found any operators that I could make an appointment with. A friend luckily came to the rescue. He had tried it and gave us the contact of a paragliding instructor. And the price is highly affordable too compared to those offered by other sports operators. Paragliding is foot-launched, motorless flying sport with the help of a nylon paraglider. Usually running off hills or mountains. After making an appointment with the instructor and having a rough idea how to get there, we reached Bukit Jugra (Jugra Hill) at 11 am. The paragliding site is behind (or in front?) 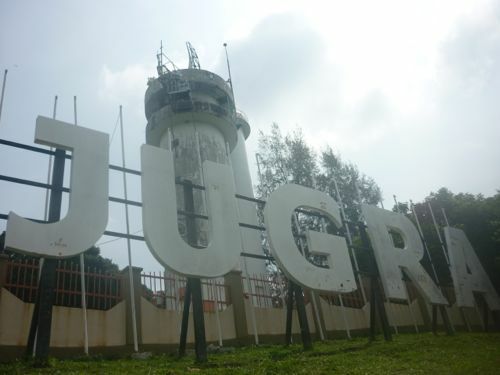 the famous Bukit Jugra lighthouse. You can drive all the way up there and park your car in the car park provided. But you have to walk to the site which is only a short walk. Bukit Jugra is about 15 minutes’ drive from Banting town. Our instructor asked us to wait for the wind. Since paragliding is dependent on wind currents, strong wind is necessary before jumping. After one hour or so, I was told to get ready and given a harness to put on. By then, we were joined in by other enthusiasts, either solo or tandem paragliding. If you are new and unexperienced, you can’t go alone and must be followed by an experienced pilot. This is called tandem paragliding which is what I did. I was a bit nervous at first but when I was in the air, everything looked so calm and serene. And I was soaring like and with an eagle, literally. The experience was awesome and I want to do it again. J and K saw me do it and they asked if they could do it too, especially J. Since the waiting time is long and there were 3 more to go, I told them we could come again next time. And it’s only for them. I remember I patronized this food outlet more than 10 years ago. That’s even before I got married! 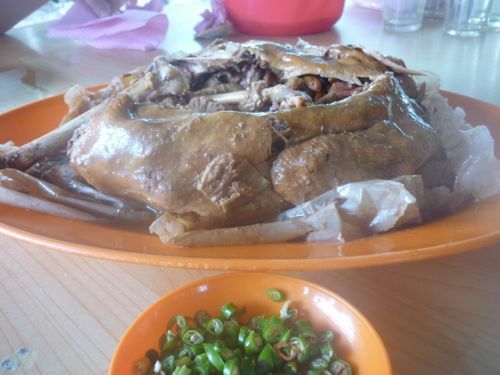 Since it’s still around and so popular, and coupled with the fact that we would pass it by, I decided to stop by at Restaurant Bukit Jugra for their signature dish Beggar’s Chicken. 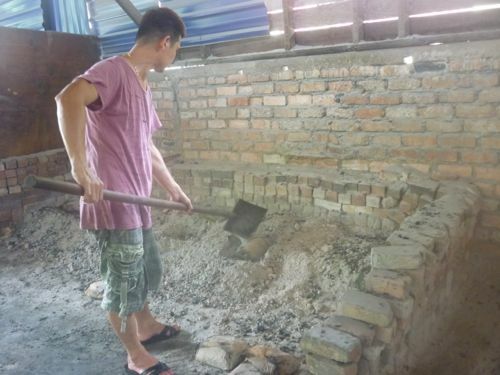 What makes this dish exotic is the chicken is cooked with glowing ember and soil for 4 hours. 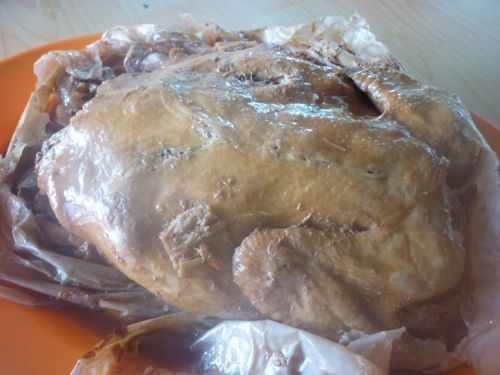 The chicken is marinated and stuffed with Chinese herbs. NOTE: You have to call in to make booking and order what you want one or two days before. J and K don’t find the Beggar’s Chicken as intriguing as what others make it to be. Me included. The chicken is fine but nothing to shout about. To make it worse, RM48 for a chicken is overpriced. Since it’s only four of us and we couldn’t order much. Besides chicken, we ordered a dish called Traditional Fish 家乡鱼 (RM35). The flesh is scraped and made into paste and deep fried. Then they are arranged again in such a way that it looks like a fish… again. I personally find the prices are on the high side and the dishes are average. I was surprised to find out that a few visitors were there praying silently with beads. One of them told me you can make wishes at the royal grave. I was speechless. Making wishes at a tomb? Anyway, Sultan Abdul Samad (Born 1804. Reign 1857 – 1898), the forth Sultan of Selangor, was buried in this mausoleum. Before Klang, Jugra was the royal capital of Selangor. 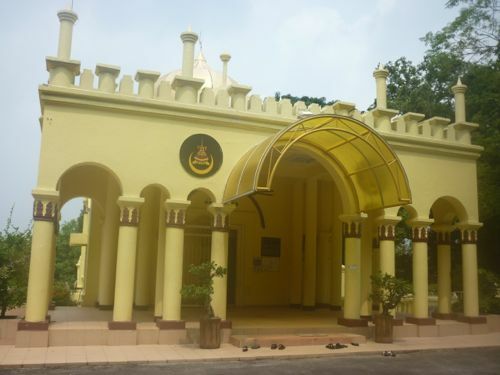 Istana Bandar and Masjid Diraja Sultan Alaeddin are located in Bandar which is about 15 minutes away from Bukit Jugra. Bandar is a place which is not reflected in its name as it is a remote village with a small population. Based on what I got, Istana Bandar (also known as Istana Alauddin/Alaeddin) is open everyday from 8 am to 6 pm. Entrance is free. But I went there, the gate was closed and there was not even one soul there. Later I spotted 2 workers there and they told me the caretaker was not around. What a shame that we missed this historical building. The 40-room palace looks majestic from the outside after some restoration works. 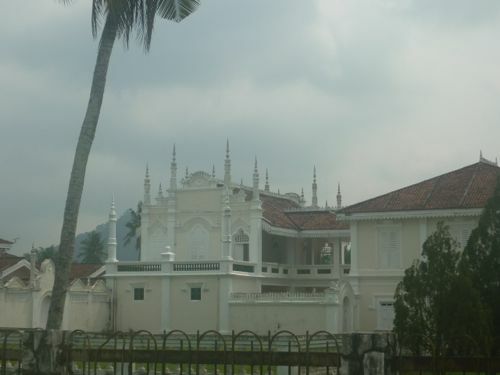 The palace was built in 1905 by the fifth Sultan of Selangor, Sultan Alauddin Sulaiman who remained in residence at Istana Bandar for 35 years. 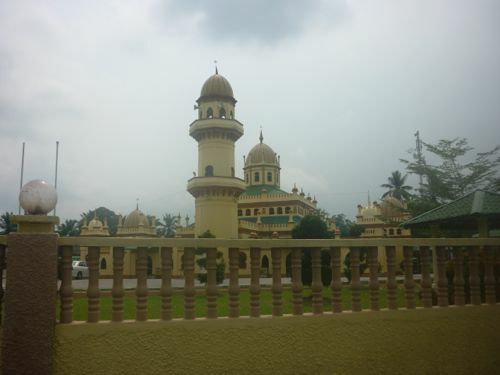 Next to Istana Bandar is Masjid Diraja Sultan Alaeddin (Sultan Alaeddin Mosque). The mosque was opened in 1906. After visitng Bandar, we were back in Banting town. In fact, we wanted to go to Kelanang Beach but we got to the wrong way and ended up in town. Anyway no regrets. As we were in town we spotted one of the 2 popular places for cendol. I was excited to have found Restoran Cendol Ibrahim Banting which is opposite the KFC Restaurant. It’s located in the alley with a roof over it. 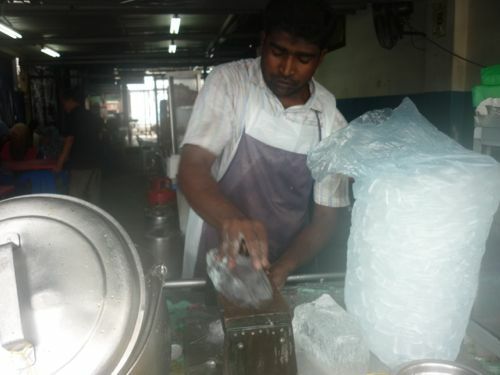 The best part of it is the seller still uses the traditional way to shave the ice. 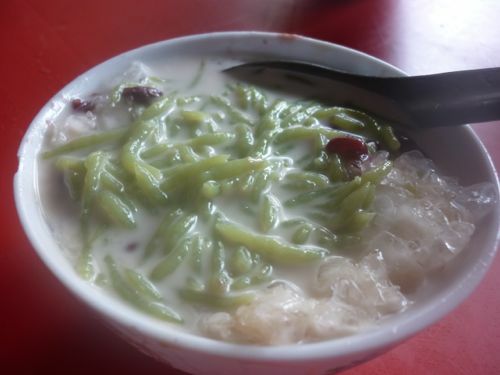 Though the ice is not as fine as machine-saved ice, the cendol turned out to be good – not too sweet. And the crowd says it all about the awesomeness of the cendol. The man behind the stall was never a moment in idle mode. He was busy serving his non-stop stream of customers. It costs you RM1.50 for dine-in and RM3.50 takeaway. The owner says the packed cendol is enough for two. At the same outlet, one can order mee rojak or rojak from another stall. Kerepek House which is owned by Fazz Enterprise has been in business since 1983. 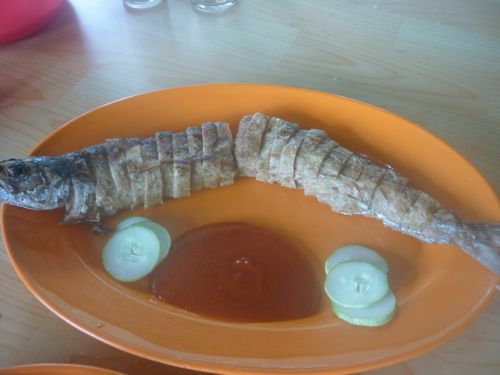 It’s in Kachong Darat, Banting. As the name suggests, Kerepek House offer a wide variety of local crackers and chips. I notice the products there are fresh and they are affordably priced. For example, a packet of 250 g of dhall chips costs only RM2.60 or 500g meruku RM3.80. Customers were streaming in continuously while we were there making our selection. Kerepek House is located in a village off Jalan Cempaka. It’s not difficult to find this place as there are sufficient signs to guide you there. If you are old enough, you’d have heard of the Sidek family. The brothers were badminton players of world’s standard. Guess what. Their hometown is in Banting. 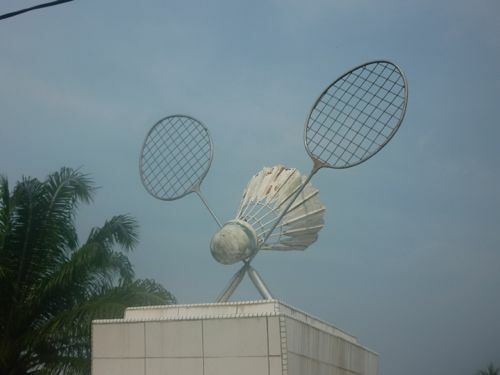 To commemorate the contribution of the family towards Malaysia’s badminton, the government has put up a landmark in front of their old house. It’s not hard to find. The house is located at the junction of Jalan Sempadan and Jalan Sultan Alam Shah. Heading Morib, the house is on the right. K wanted to go to the beach no matter what. As a father, what choice do I have? I had to obey! Heading Jugra once again but this time, instead of right, I made a left turn to Pantai Kelanang. As with other places in Malaysia, the problem of insufficient road signs is not unusual. I had to follow my instinct to get to Pantai Kelanang. Lucky for me, I didn’t make a mistake. I knew I was right the moment I saw the sign “Pantai Kelanang” right in front of the beach! How ironic! The beach is not clean but the sands are fine and white. It’s hard to find powderish sand especially for beaches on the West Coast of Peninsular Malaysia. Pantai Kelanang attracts many beach lovers and children will love it as there’s a playgorund near the beach. It’s not as popular as Morib Beach but Pantai Kelanang is worth a visit. But do set your expectations right before you go there. Dong Zen Temple is famous during the Chinese New Year because the Monastery is decorated with beautiful and colorful lights. Of course, when we went there, the lights had been taken down. Since K had not been there yet so to speak (for the first visit, he was in his mother’s womb), we promised to bring him there. We made a quick tour of the place since it was already getting dark when we were there. There’s a koi fish pond and nice garden there besides the usual temple there. The compound is huge and it takes an hour or more to tour. We just found out a little secret about the temple. Right at the end near the outdoor washroom, there’s a mini deer park – a heard of 5-6 deer altogether. Of course, since it is a monastery, you will sometimes bump into monks or students there.